First Impressions (also posted on OOAK Forum as they are pip/blocker enthusiasts) . . .
For blockers and darksiders . . . So far, I ABSOLUTELY LOVE IT! I haven't felt excitement over a blade in a while. It took me about 30 minutes to get used to it . . . seems like two gears or maybe it's just two strokes . . . balls die and drop short in gear #1. Once I adjusted to the amount of effort, this was extremely effected. In short, more balls landed on the table . . . way less errors long. Yet, when I needed to put a ball away, it did not come back. I feel like the amount of dwell/flex was just enough to provide feel for up-close and personal shots AND provided a bit of catapult for mid-distance and/or put-away shots. Do to my physical disability, I tend to rely heavily on quick wrist shots as opposed to graceful full-body shots a la loops. Grand Master seems to suit my game perfectly. I've always been a fan of Dr N gear and have owned many of his/their blades, included the mighty "Special", a couple combination blades, and Firewall Plus. They are all sweet, but I'm finding that the thick balsa blades don't suit my game as much as the thinner counterparts. Disclaimer: The blade was equipped with Killer on FH (SP) and Trouble Maker on BH (LP). I am not 100% sure what attributes to attribute to the blade vs rubbers as it was the first time playing with all them. If you find you like the Neubauer stuff, You should check out the Rendler line! 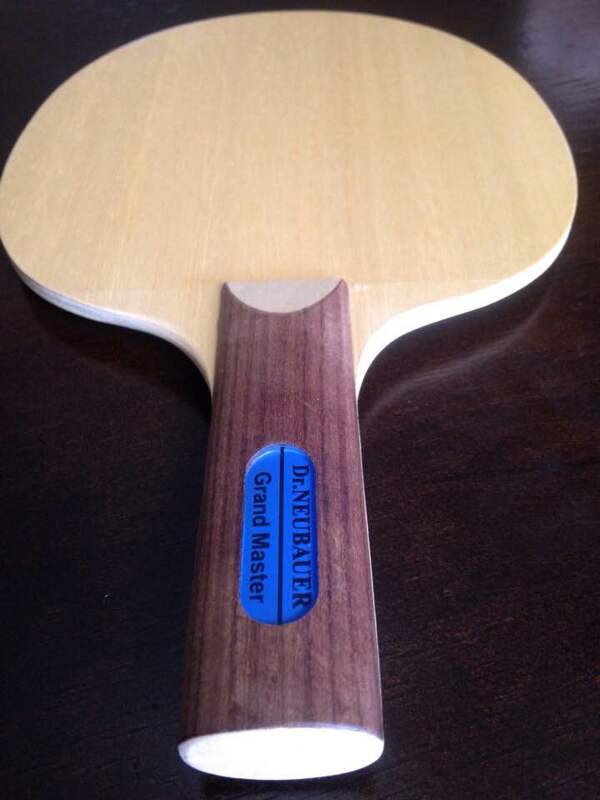 Rendler is the brand that makes most if not all Neubauer blades. Very similar and some more advanced. Thanks, Doc. I'll check out Rendler. Yet, Carsten has been wonderful to me over the years so I feel a sense of loyalty. That is incorrect I'm afraid as only the Dr. N blades with the very thick balsa core are made by Rendler. These are only very few of his earlier blades. Most of recent years (and that's quite a few!) blades do not use any, or if only a thin, balsa core and are not made by Rendler. I know Rendler made lots of Neubauer blades with thick balsa cores. Rendler also has unique technology that they didn't incorporate into Neubauer blades they made. Tommy could ask Carston but don't know if it would be something they would want to disclose. Rendler is a superior product but not as well known in the USA. Since when does Rendler make non thick non balsa blades? Hence the Balsa for lightweight and vibrational qualities. Look up Re-Impact or Rendler. I'm very familiar with Re-Impact and also the few blades they made for Dr. N, however I have not seen a single blade they have made (double checked today on their website) WITHOUT balsa. That's incorrect! For Taipan (and its off shoots) you are correct but the other blades you mentioned contain balsa though not necessarily very thick. Just check the Re-Impact website. BTW, I have a brand new Grandmaster with the Troublemaker on it. If anyone wants it, I’ll sell for a fraction of what I paid. Great so I was right .. Rendler does make non balsa blades! No thanks for the troublemaker I believe I have one.